Are you using social media to market your website or to create relationships within your niche? In this post, you are going to discover seven new social networks, that you can use to promote yourself and build new connections. Some of them are brand new while some others are a little more known. Aside from Facebook, Twitter, Google Plus, Pinterest, Instagram, YouTube or LinkedIn, be sure to take a look at these social platforms and hurry to register your name or brand. You don’t want to lose the chance to jump on the next social media trend! Here are the 7 new websites to consider. Simplicity, beauty, transparency and a “virtual place” where whatever it is published is not drawn for online advertising. This is, in a nutshell, the manifesto of Ello, a social network similar to Facebook (but perhaps even more to Google Plus), and very minimal. At first glance, I think it’s hard to understand how to orient and interact in a fun way with other users. The “noise” section offers a caldron of random posts (Pinterest syle), which makes Ello, at this time, a mix of things already seen. Pros: start from scratch with a new “Facebook”. Cons: how will they keep the platform ads-free and prosper? Ello is invitation-only. Hit me if you need an invite code. “This” looks minimal like Ello. It claims to be the best place to find entertainment, art and journalism news on the web. Still in beta, you need an invitation to join. Ask friends if they are already into it, or add your email to database to receive an invitation when the public beta will be launched. I’m still waiting for an invite to register. “A fun place to meet people“, that’s Shots motto. It’s a social platform (mobile only) you can use to meet other people through the selfie! In fact, the structure is in all respects similar to Instagram, but focused on selfies though. The app is super usable and intuitive and it would be an excellent social media for those fashion bloggers, for example, who want to pierce the internet with their image. You can just upload live images from the front camera of your smartphone and it’s aimed at a “teenager” target. About 1 million downloads, at this time, with 75% of female users under 24 and used by several celebrities. Pros: excellent user experience and a well-defined target. Cons: what will happen when selfie won’t be popular anymore? Pheed is mobile app that allows you to upload text, photos, video and live broadcasts. A novelty compared to other social media is the fact that on Pheed you can earn money online. 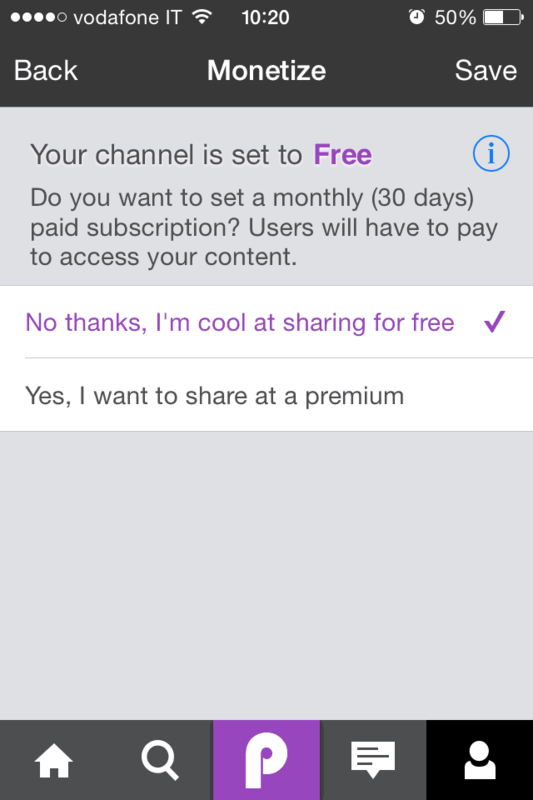 Well, yes: you can request a fee ranging from $1.99 to $34.99 to allow users to access your content. It’s an interesting social where combination of potential quality content and monetization meet. Pros: if you will truly find “excellent” content, it could be an interesting place to enjoy quality information in any field. Cons: will it become popular? Of all the social media listed, Medium is perhaps the best known. It offers a list of recommended content (top stories and staff picks) in a minimal graphic, very light and airy. It collects content from very influential authors, because at first it was addressed (by invitation only) to popular writers and “thinkers”. Since one year, it opened the doors to everyone and is, in effect, a particularly trendy alternative to Tumblr and WordPress. Pros: it ranks “higher” as quality content than Tumblr, for example. Cons: it risks to being a “mere instrument”, used especially by writers or professional journalists. Chirp focuses solely on the sounds. Basically, you can register your “chirp” : a phrase, a special offer if you have a shop or a photo, accompanied by an audio caption. Your “chirp” will be collected from users who are nearby, as long as they chirp activated. Pros: great tool for local marketing, implemented in real time. Cons: not so popular. Will it ever spread? Born this fall, Tsu got 1 million users through word of mouth in a little over a month. Tsu focuses on the generation of valuable content from members, encouraging them through a very strong message: 90% of advertising revenue is distributed among its users! To join Tsu right now you need an invitation: just visit my profile to register. The goal of Tsu is to generate a solid network of users, rewarding people for being “social” and influential in terms of relationships. Be sure to take advantage of this “social wealth” when joining Tsu. Pros: users are strongly encouraged to publish their best content. You can make money by just using Tsu. Cons: it slips into the vast sea of the social platforms used just for publishing content. Important note: TSU was taken down on August 2016. Hope these resources will help you increase your connections online, while marketing you and your content. And you, are you already on these social networks? Please connect with me and leave your thoughts in the comments below, thanks! Wow! These platforms keep coming up every single day or what? I signed up to Tsu but did not really use it 😉 One thing I know is the more platforms you join, the more less productive you become. There should be a maximum I think. I just requested for an invitation on ello. Will be trying that one out. Thanks for bringing these platforms to our notice man. it’s hard to follow them all! We should focus on finding the right social media for our audience, and stick with it (or just few of them). Most of the time, I sign up to these new social networks, just to “reserve” my personal name. When I come back to the URL after some time, I discover how things have gone during my inactivity. I’ve just sent you a personal invitation to Ello, from my profile. Thanks for visiting and commenting today, my friend. I never heard about all these new social networks till now, i heard about Ello i think but i am not sure, i want to try some of them, any way thank you for sharing about budding social networks, may be some of them go viral. just sent you an email with the invitation code for Ello. Be sure to connect with me at these social networks! glad you liked the resources mentioned here. Hope they will help you market your website and increase your connections! Actually I am familiar with only three from this list. Yeah, as you said, Medium is more familiar to me. And I have heard about Tsu and Ello a bit. All others are new to me. Let’s see how these beat the existing social network giants. Thanks again for the post sir. Thanks for the kind words and happy to hear you enjoyed the new social networks mentioned here. I’m heading to the interview post right now to answer to more comments! Who knows if anyone of the sites I listed will be the new Facebook or the next trending social media platform? Thnaks for visiting and commenting, my friend. Honestly speaking, I’ve just heard of 3-4 from this list, the rest I heard for the first time and would be checking them in a while. But the point being, how active can we remain on all of these…lol…I would be lost just in these new ones if I were to sign up for them. I am glad you mentioned the pros and cons of each one, which helps for sure. Ana Hoffman was kind enough to send me an invite for Ello once she joined, though I’ve yet to check it our fully, and even Tsu I’ve got people asking me to join, just not got down to it so far, though heard a lot of positive reviews about it. Some people are really earning well from it, though they are also very active there, which is what brings in the money, isn’t it? Ah….I need to take a break from the ABC and start off with a little of these, especially Medium as you recommend it. It’s one of the reasons I wrote that post about Aha-Now blog community, to recommend anyone to join! I listed these new social networks to give people some alternatives, but you’re right. It’s impossible to manage too many accounts. Better to focus on few ones, and do a nice job there. After all, we want to target a specific audience, right? Thanks for taking the time to visit my post today, and leave your comment, Harleena. These social networks are really COMPLETELY new to me! WOW. They are amazing. Gonna try them! glad you enjoyed the new social networks mentioned here. and please connect with me at those platforms! Can you please tell, which social plugin are you using in the right side bar widget? it’s “Monarch Social Sharing Plugin” from Elegant Themes. It also displays the social buttons at top and bottom of my posts. Chai….although have never heard any of the list before now that I know them I think I should try some out and see how people are using them. And remember to connect with me at these new social networks. Wow! Except Ello, I have did not have any info on the other social networks….until now. I just stick to a few of them which appeal more to me and to my audience. More the number of such platforms you join, the difficult it becomes to manage them. We do however have a few tools that unify most of the popular social media platforms so that you can access them from under one roof. Just use the social channels you think may fit your niche and audience. I use HootSuite PRO to manage all my social media accounts into one single dashboard. I’ve heard of a few of these before but not the others. I haven’t signed up for any of them (and probably won’t, to be honest) but some of these are very interesting and I’ll have to follow them. If any of them actually takes off, I suppose I’ll have to say that I heard them from you first, huh? These are certainly interesting and I wish I had time to at least give them a look, but I just managed to cut out a lot of time I spent on social media by purchasing HootSuite. Last thing I need is to get sucked into a bunch of new networks, LOL. Still, nice to hear about them though. Thanks Erik! even if you have Hootsuite now (I use the PRO version). As I mentioned, I’ve signed up to each of these new networks, also for reserving my personal name, as account. You never know if some of these website will become the next trend of the internet! ;-). Thanks for taking the time to visit and comment, James. good to see you liked the post. Thanks for sharing this list. I personally like Medium and Tsu. medium is good to write posts and gain traffic and Tsu I started using today and it also seems good to me. I need to dig more into Medium. I’m not so active on Tsu, I visit my account every 4-5 days. You’re right I have not heard of these before, although some of them sound interesting. Seems like you’re on the cutting edge. Shots is too funny. Should’ve know it would just be a matter of time before selfies would become an essential part of a social media platform. But audience over there doesn’t interest me! I’ve not written any post on Medium yet. I need to invest some time and dig more into it. I’ve registered to all these new social networks just to reserve my personal name, and to see how they will go in future. Thanks for visiting and commenting here today, Martin. It was a great conversation with you, really appreciated! Hi Erik! Thanks for listing all this social neteorking sites here but its not that i don’t about them. Now coming to the point, i am trying to get into Ello from last 1 month but got no invites from anyhwere.. Please can you invite me to Ello. just sent an invitation code to the email you used for commenting. Hey Erik… Thank you so much man got my invite. I had just lost hope on this but thank you very much! Yea… Nice list of social bookmarking sites. Even three of them are unknown to me. Nice share ! Actually they are social networks, to engage with users, not for “bookmarking”. Glad you liked the post, Rahul. Wow, it seems like social media sites are just popping up all over the place. Other than Ello and Tsu, I haven’t heard of these others. Not sure if I’m going to sign up for all of these though. But they are interesting. I know I received an invitation for Tsu but haven’t signed up yet. I’ll have to do more research before I make any decisions about these other platforms. And I’m going to write soon a similar post with some new social networks! If I were you, I would register just to reserve my personal name. You never know if some of the websites mentioned in this post will become the next trend of the internet! Thanks for taking the time to visit and comment, Andrew. Before couple days I used only Facebook social website and note have other social website information but today after reading your article found 7 social sharing website. Thanks to share this post with us! Hope you find these resources helpful for your internet marketing. This is an awesome post at social networking. I agree with you. Really good resource and very well written and described with supporting pictures. Read many posts on this topic but it is one of the most complete of them. glad you liked the post and you found the new social networks mentioned useful. You did a awesome job. I am really unaware about all these networks till reading your post. Now I got some insight about other additional social networks and really very happy about that. You are doing a amazing job honestly. Continue writing new things like this. Thanks a ton!!! Happy to hear you got some new insights to use to increase your connections and promote your content! It’s a beginning of new way of monetization. 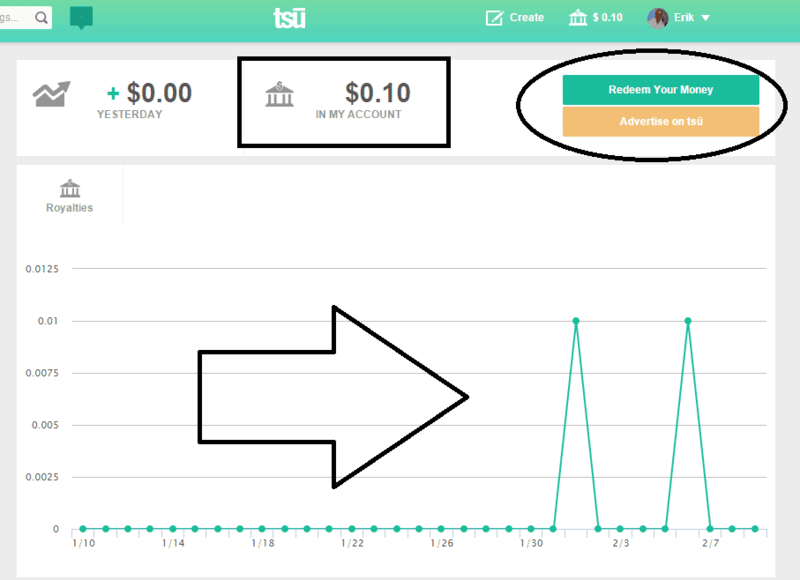 As we have seen that tsu allows you to monetize your account, similar to tsu lots of new social networks are coming which opens the door of new way of monetization. Thanks for sharing, informative guide it was. Let’s see how Tsu will go in future. I’ve read an article just today about how the initial fast growing trend is already stopped. Thanks for visiting and commenting, Rahul. Wow… 7 new social media. Still I didn’t join Ello I just heard that name few months ago. I use tsu but I didn’t use it so much. Thanks for notified me for this new social media sites. If you want to join, I’ve just sent at your email an invitation code for Ello. Great post. I totally agree to your points before your post I no heard about social networks. But found your post I known 7 new social networks like as Ello, shots and pheed etc. I have bookmark this page for future. OMG, I am aware only about two out of the list, Ello and Tsu. However, I am not using any of them but do have an account over ello. Great list. I will surely do check out all of these new social networks and try to start using them. Thanks for this awesome list Erik. Like Medium, also Tsu and Ello are quite known. Glad you discovered some new resources here, Atish. This is an amazing list of social networks. I don’t know how I missed to leave my comment in this post, Atish shared your post today and I immediately headed over here. I know Ello, Tsu and medium and unaware of such a great list of networks to connect with the people of same wavelength. Time is my biggest constraint and thus limiting my social presence. As you mentioned, Tsu, Ello and Medium are quite known. While the other social sites listed in this post are pretty new. Glad to hear you learned some new resources here today. Thank you so much for sharing and for commenting, Nirmala. Good to hear you found some new ones, Sneha! Thanks for sharing these with us. I assume there will always be new social platforms popping up trying to eventually beat out some of the more popular ones. Just like most things, they all eventually fall by the wayside at one point or another right! These are coming on the scene just hoping to have enough of a following to swoop in and take the lead. I don’t use my mobile that much so I definitely wouldn’t join the ones where it’s an app access only. That’s why I don’t have an Instagram account. I know, I’m so old school it’s pathetic. LOL!!! I won’t be trying any of these though, I can barely keep up with the ones I’m currently on but they’re good to know about at least. When someone mentions their name I can’t play dumb now! but I have ready another post on the latest new social networks I found over the internet. I think I am going to publish it within 2-3 weeks. I know you’re old school. And I think this is one of the things that makes you differentiate from others. You are doing such an awesome job online, there is so much to learn from you, Adrienne. and thanks for stopping by, leaving your views here. Well packed and given the information for us. This quiet interesting list to know about of new pop up in social media world. Ello – Started loving it, awaited for long time and received the invitation to join in it. I eventually see that there is a lot on conspiracy between that Ello will beat Facebook, what do you think of that ? there is much buzz also about Tsu beating Facebook, but only time will tell the truth. You see, there are so many new projects nowadays, that we need something really original and unique, to create again the same success of the big of the internet today. I’m excited to see what future will bring us. Thanks for visiting and commenting, Siva. You’re right. I’ve heard a lot about Tsu from many bloggers in the past couple of months. I guess, it’s time now to give it a try ! glad you liked this list. I look forward to connecting with you on Tsu, then! I have to make a confession. I have not heard of any of them. Perhaps I am like Adrienne, old school or perhaps I have been hiding in a cave. I did check three of the ones you mentioned and ended up reading an long article on Medium, which basically talked about blogging perhaps joining the dinosaurs. How depressing. The one that caught my attention is Tsu. I like the idea of income sharing. Reminds me of Squidoo before they went all uppity, forgetting that it was us, the squids that made them famous. I will have to hit you for an invite to Tsu, which I’ll do after I finish this comment. It’s good to be old school, Dita. Moreover, it’s better focusing on the social media channels that works for you and your audience. Great to see you signed up to Tsu. Just sent you a friend request over there. And glad you liked the post, thanks for leaving your views. Internet is ocean of social media network. There are lots of social media sites, and it is difficult to follow them. But thanks to give information of some other social media network. Which are effective to increase some connections and traffic. But seriously I thanked you to tell about Tsu. A new kind of social network which increases the connection as well income. After this, be sure to friend me there! Hope these social media sites will help you increase your audience and connections. I really don’t know these Social Networks and now love to join these social networks and i want to experience and love to interact with the people. Happy to hear you liked the post, thanks for commenting! Great list of social networking sites man. I am pretty sure, my circles got extended more after using these social bookmarking sites. Good to hear that, Rahul. Be sure to connect with me at these new social networks. I Really don’t know about these social networks thank you so much for your kind Post. One of the most trending right now is Tsu. according to me, Tsu is the best social. I hope founders will do something “special” to attract more people to join it. Nice list of new social media networks from where new bloggers can get traffic. YouTube is great to rank fast with videos. What a Great news Erik. I never hear about these social before. 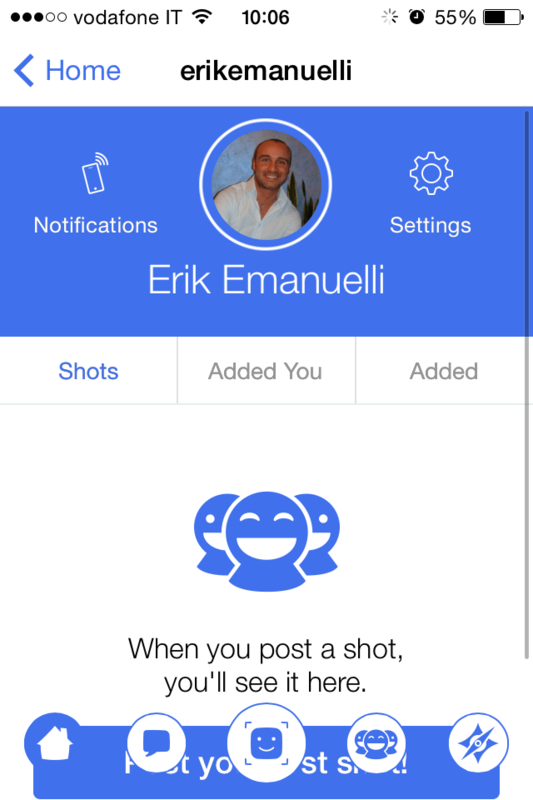 Shots is best social for meet people and enjoy a lot. Have you joined Tsu, Ankush? I am using Facebook for years. But now, these new social networks can also helpful for promotion. Anyhow, Thanks for posting this info. glad you found some alternatives to the major social networks out there. who knows if some of those social networks will be the next Facebook, right? I am familiar with the Ello, But you have great list here. And These could be the next big thing of course!! We can use these for our promotions too!! Thanks again for the awesome list of new Social Networks. Glad you enjoyed the news. Thank you so much for sharing this wonderful article on New Social Networks. Almost all of them are new to me and i have never heard about them. I am going to explore more about them and will surely give them a try. Glad you enjoyed the post, Vinay. O thanks for sharing, i never knew their are any such social networks apart from the facebook,twitter i will surely give them a try. Glad you enjoyed the new social networks mentioned here, Mahesh. Appreciate the positive feedback, Nawaf. Most of the bloggers prefer using conventional social media platforms like Facebook, Google Plus, Twitter. though they are effective still but as time progresses, we need to find out more ways for promotion. I use Medium on a regular basis but was unaware of Ello, This and Shots. I will definitely try them out. Thanks for the information. Thanks for checking the post and leaving your views. Hey Erik thanks for this share…. i knew about TSU but didn’t have idea about the others… Thanks for letting us Know. Hope you can find some new audience there, Krish. I could not know about those social media networks which you have described in your post. Thanks for sharing those new social networks. But I have a question, can I share my blog post through those new networks for driving web traffic? Yes, you can share your post there, Palashtd. So nice to see your valuable content on new social network. I knew about ello before i landed here but all other is new to me. I am very happy to see the feature of this new social sharing sites. Specially on shots and chirp where one is special for selfie and another one is for sound. Thank you for your valuable content. Glad you enjoyed this list of new social networks, Yasin. But sometimes it’s good to have some new social network, where you can look for new connections. Hi Erik, I like the sound of Medium which is a bit like tumblr, I’ll give that a try after leaving this comment. I have used Tsu before, I posted a couple of bits, but I’ve lost the login details. Medium is a powerful channel, Marsha. Not too bad for Tsu, as it was taken down a few months ago. Thanks erik for this amazing information, the title is truth. I never hear about these social networks, but now I am aware and know there pros cons thanks to you for this information. One other question ! is these social network have any influence on blog or website to rank? I know Ello is working quite well among marketers and bloggers. Do give it a try and let me know. That is super cool. These are really worth try social networks. I wish they become popular in future. Ello is a promising one, Atul. Hi Erik, Great share I must say. I found this post on one of my Facebook group and the post title forced to visit this post. Wasn’t familiar with most of the social networks you shared here and I have bookmarked this one for my future references ! Thanks a lot again, Erik. Good to hear you found some new resources in this post, thanks for the feedback Vipin. Although some of them already disappeared, Rawat. Great list Erik. I have heard of Medium.com. Now, time to checkout Ello – even if it seems like I’m late to the party. Thanks for describing these social networking sites. It will help me a lot. Wowww… I didnt know medium is that much powerful channel….!! Will be using that going forward now. That’s awesome information about the social media networks. Thanks for sharing those new social networks. I only knew about medium from all the networks listed in this post. I never went to this site, but I would surely like to explore this new social networking site. thanks for your information and gaudiness. Really surprising list. All the mentioned social networking sites except medium were completely unknown to me. Saved all the names for future reference. Good job Erik!